A modern beach house for the savvy traveler, The Landon offers a quiet respite with a thoughtful array of amenities and services to complete your getaway. 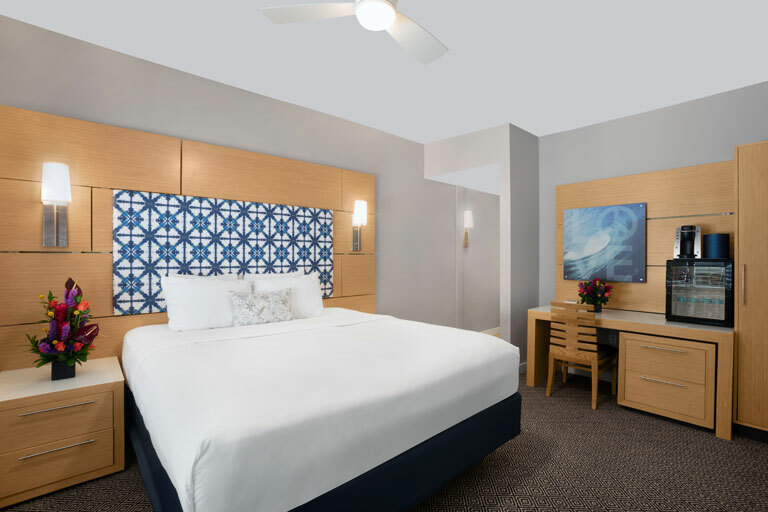 Each of the 46 guestrooms is spacious and airy, appointed with sleek furniture, high-tech accessories, plush bedding, refrigerators, and a comfortable workstation with plenty of natural light. Whether you are staying in or stepping out, our upscale, boutique property on East Bay Harbor Island is the perfect launchpad for exploring neighboring Bal Harbour or venturing further afield to South Beach and Downtown Miami. The knowledgeable concierge team can help perfect your plans from dinner reservations at world-renowned on-site restaurant The Palm to tours around Biscayne Bay. With its modern, comfortable accommodations, prime location, friendly service, thoughtful amenities, and superior price point, The Landon is a first choice for the well-traveled vacationer and smart spender. Each of The Landon's 46 custom-designed rooms features king beds fitted with luxurious linens and a tranquil color palette inspired by the sea. Enjoy 50" HDTV entertainment systems, in-room safes, and Keurig Coffee/tea brewers. Get productive at the executive desk, and always stay connected with complimentary Wi-Fi.